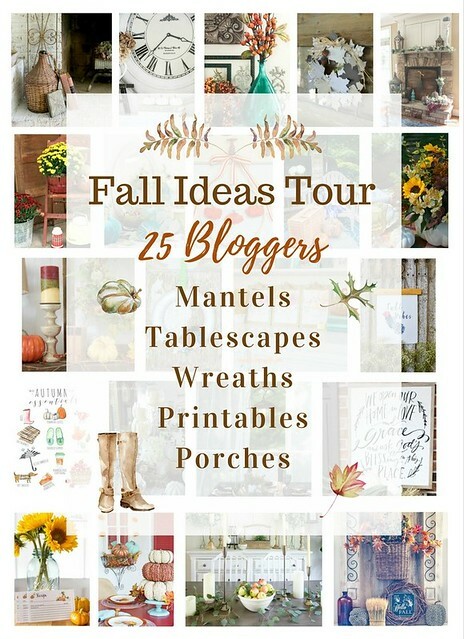 Today I am joining in on the fun of the Fall Ideas Tour. are presenting our Fall Porches. on lots of amazing Fall inspiration from the links below. I love this corner of my front porch . . . to sit and watch the world go by. Neighbors on power walks . . . neighbors walking their dogs . . . children riding their bikes. It’s a great neighborhood and we Southerners love our porches! as they walk up the steps to the door. I love having flowers on the porch at all times. Well maybe not so much in the days of 30 degree weather! Which is not too often. For many years, 20 to be exact, I have placed my “Welcome Friends” out on the porch each Fall. A pumpkin that I found while traveling with friends in Colorado. I carried that pumpkin on the plane ride home . . .
checked my carry on bag as I wanted to make sure this pumpkin made it safely home. 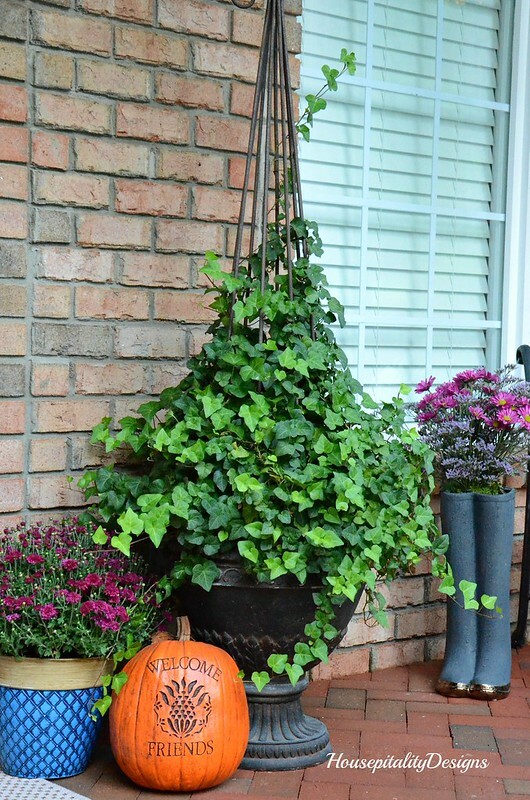 Did you notice my boot planter in the photo with the pumpkin? I bought this cutie at Arhaus and it was originally an olive green in color. I painted it a dark gray and have to admit it looks much better. ready to bloom …. however, I was happy that I was able to find the color I wanted. Even my favorite garden center’s mums were not available. Soon he said. There were no pumpkins out yet either . . . too early. But soon I will be making a trip to the Farmer’s Market for my Fall pumpkins. 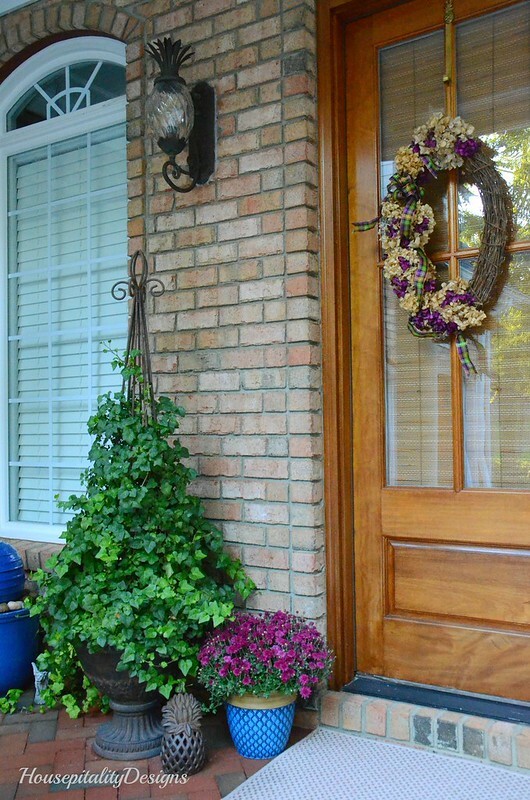 Since my home is officially on the market, I debated about the wreaths. I debated with myself for a minute . . . wreaths won the debate. My Fall wreaths from last year with blue dried hydrangeas were in the attic. The hydrangeas turned brown, but that was O.K., as I fluffed them up with plum! hot glued them to the dried hydrangeas and added ribbon. as I did in the sunroom. you will quickly feel a sense of calm when you hear the sound of trickling water. It was a little bittersweet when I was decorating my porch for Fall this year. Will this be the last Fall porch that I do in this house? A home that we built and moved into on the day my sweetie was born. However, things change and will only get better. with her having all the final decisions. It will be a good thing. As I stated above, there’s a great party going on! A party of fabulous Fall inspiration for all things home and garden. The great FALL IDEAS TOUR !!! All the links for each day are below. during Hurricane Irma. I will be glued to the Weather Channel. Some of my family have evacuated and some not. Emergency Management team in South Florida. So my thoughts and prayers will be with everyone who will be affected by this horrific hurricane. I’m plum crazy over your porch no matter what the season Shirley, but I think it really shines in the fall! Your hydrangea wreath is beautiful with the addition of the plum hydrangeas and beautiful ribbon that ties into your blue accents. I know your home will be sold in no time! We had our bags packed to head to Savannah for a few days, coming home early Saturday well in advance of Irma making landfall if her tracking stays accurate but after hearing about the gas shortages and traffic reports in Georgia decided to stay home. Thoughts and prayers for all those in harm’s way and Irma’s path, including your brother-in-law. I’m hoping she miraculously turns to the Atlantic. Thank you Mary….I fear for those beautiful coastal towns…and yes my brother will be definitely keeping us informed on the latest. 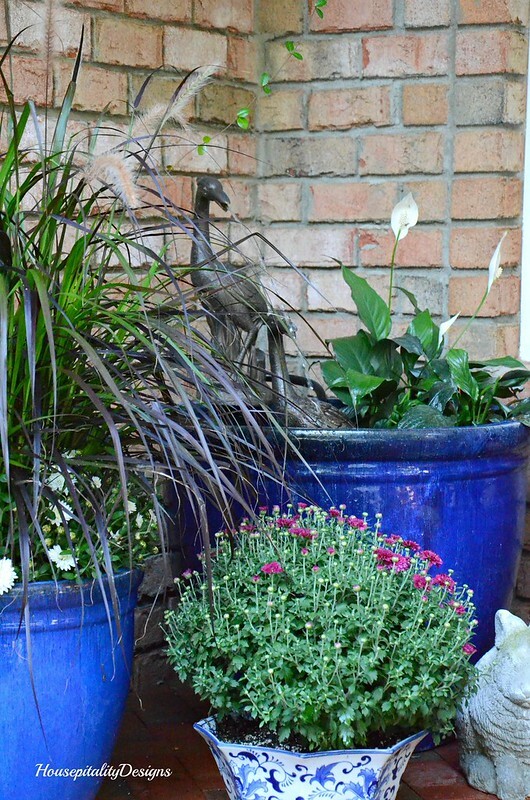 Plum is a great color to use for fall on your porch. Everything looks so inviting and I know that anyone who comes to your home won’t come in right away because they are admiring your porch. Love! I love your porch and the welcome pumpkin and those shoes are so cute. 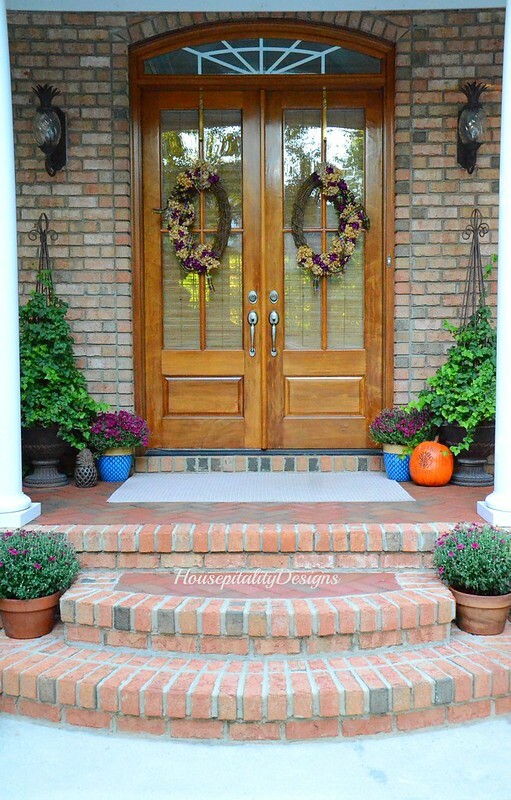 The porch looks fabulous and I love the additions to the wreath to tie in the plum color. Your porch is fabulous! The plum color is such a pretty and fresh idea for the season – the wreaths are gorgeous! You were so lucky to find mums! Even though this is your last fall porch in this home, we know you will carry all of your memories with you no matter where you go. Best wishes for your future porches! Love your “plum crazy” porch. It is so cheerful and inviting. You will have cars lined up to tour your gorgeous home and in turn multiple offers. While it is hard to leave a home you have built, new beginnings are good for us and great fun. You will enjoy making a new home – home! I love each detail especially the wreaths- they are a perfect greeting to those who will be visiting your home. Best wishes with the house on the market- I still say your home will go quickly! I’ll be joining you in praying for your family in Florida, Shirley. And for everyone else. Your plum berry colors are so pretty. I love it in your sunroom, and this color looks wonderful out there on your porch. 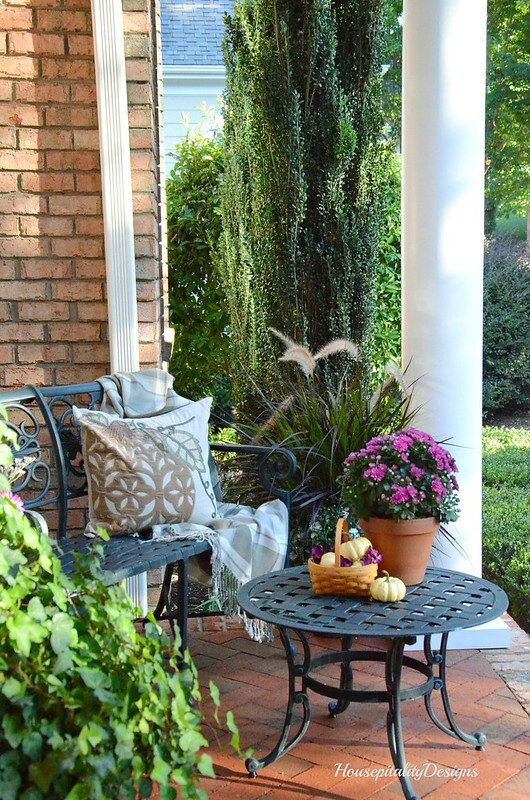 Your porch is such a grand size, just right for visiting with friends over a cup of coffee. Beautiful! Beautiful colors! But how do you manage to keep your exteriors so clean and buggy free. Seems I have to power wash my porch and patio every other day to keep these southern vermin at bay! Everything looks beautiful! I love the plum accents, and I’m glad you decided to put the wreaths on the doors. They look gorgeous! What a lovely way to add color to Fall decor. I am loving the plum and blue together. 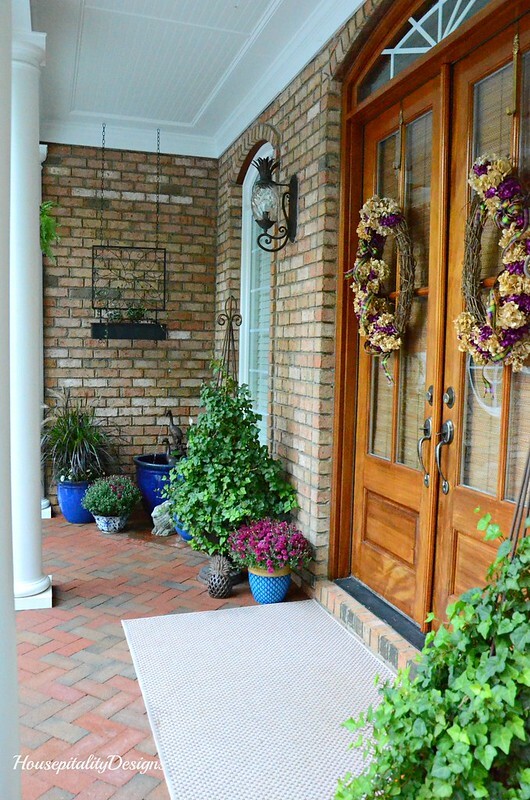 Your hydrangea wreath is stunning and your Fall porch is welcoming. I can see why you enjoy it so much. I am sure your new home will be as lovely with your style and talent. Thanks for a beautiful tour. Well my goodness that is beautiful. Love the porch, the doors, the plum – it’s all stunning. I love the colors you chose! That wreath is stunning! Your porch is beautiful! I LOVE the plum colors!!! They look beautiful with your cobaly containers! The ribbon on your wreath is gorgeous! I have gotten pumpkins as I went to an Amish farm I go to each year then my grocery and Walmart got them this week:) I am so excited that your house is on the market!!! It will sell SOON, I am sure! Have a beautiful weekend!!!! Hmm, just noticed that my last post didn’t show up? Wonder why? Very beautiful Shirley. I love the touches of plum!! I love adding a bit of it as well. Your porch is so inviting. What a lovely color scheme. Shirley, I’m plum crazy about the beautiful colors on your porch. The wreaths with the pretty ribbon are gorgeous. Don’t be surprised if the new buyers ask to keep the wreaths!!! Praying for the safety of your family members that are located in Florida. Shirley, I really love the plum and it works wonderfully with your cobalt blue! 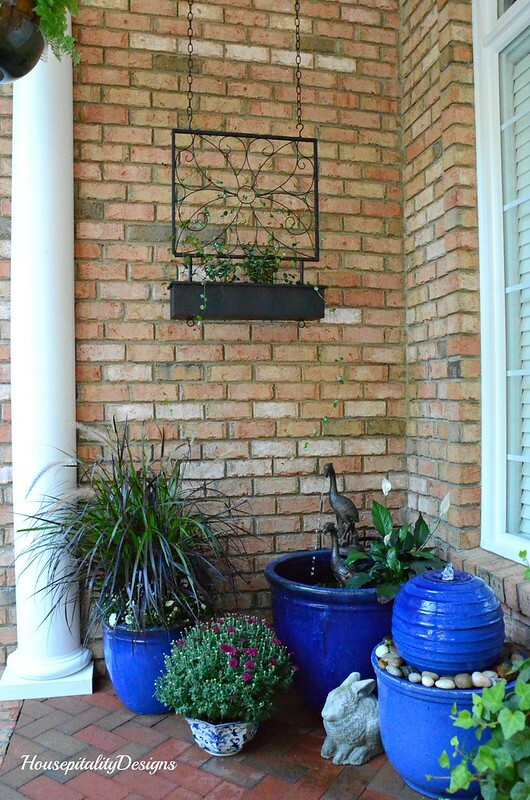 Your porch is so welcoming to anyone who might be visiting! Prayers for your family in Florida! Shirley, I really love your plum touches; changes things up a bit from the traditional oranges and such, and that bow is gorgeous! Seems you’re always finding unique ways to create new looks, which makes things exciting for your readers as well. Hope all goes well with this storm, as there has just been so much devastation of late. My prayers for the safety of all. Hugs! Gorgeous!!!!!!!!!!! Refreshing departure from the norm! Shirley, your porch is beautiful!! Bittersweet, but berry beautiful, Shirley! I love the colors you are using this fall. Your wreath is beautiful. Your ivy planters are lovely. Best of luck in the sale of your home. Beautiful! Love your plum touches! Gorgeous porch tour and I LOVE your colour choices, rich and very welcoming. It’s hard to pick one thing that stands out, Shirley! Everything is so beautiful and I love the way you wove the beautiful plum tone throughout. I’m in love with plum too! I used it some last year and have really added it more this year. It’s not my normal color palette, but it feels so perfect for fall as your gorgeous porch obviously shows. I love all the touches and that wreath is great! 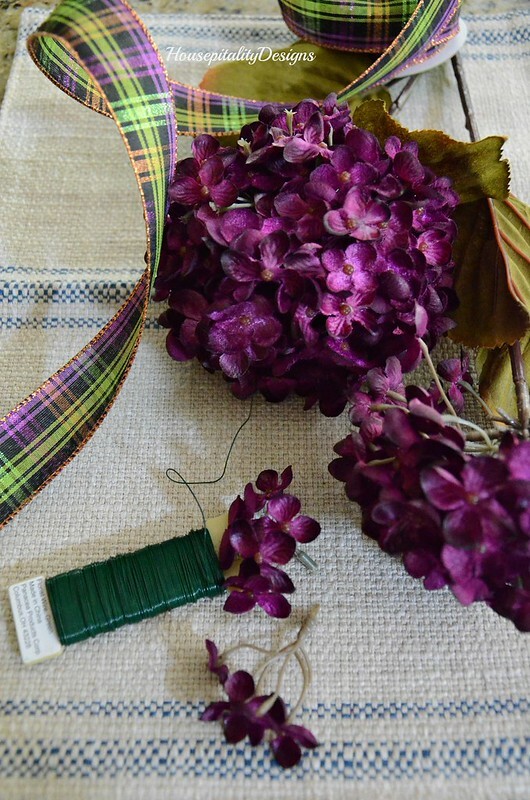 I never would have thought to use plum in my Fall decor, but it couldn’t be more perfect!!! What a pretty Fall porch! Love that color! 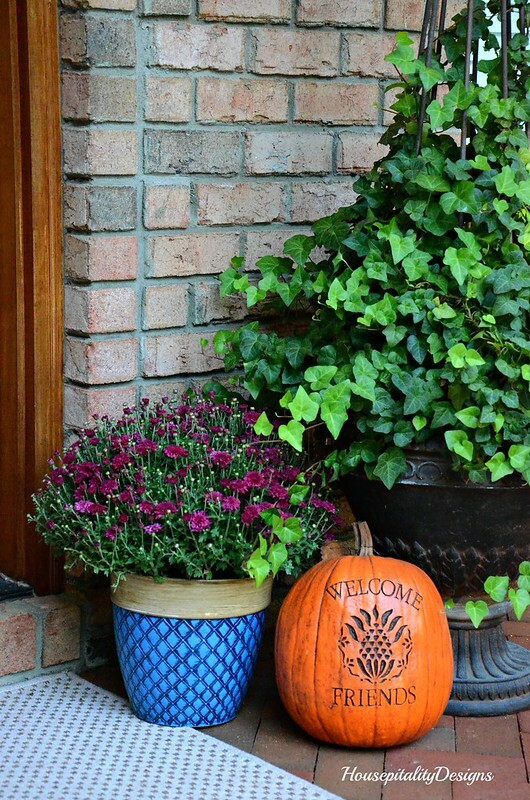 And the pumpkin, the boots planter and the wreath you’ve made! It’s all gorgeous i that lovely plum shade. 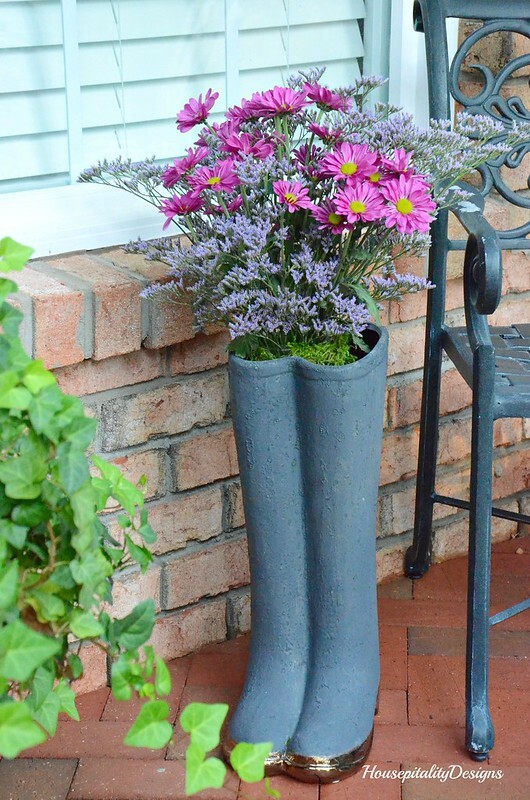 I love using flowers for my decorations,and often choos mums for fall decorating the porch. The dried hydrangeas are adorable, a man cannever make mistake adding them to a wreath. Thank youfor theinspiration! 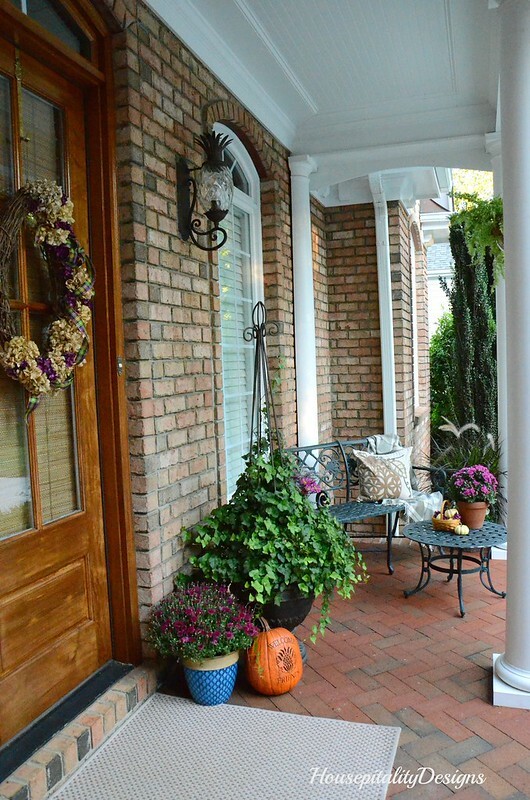 Love your fall touches on your porch. I like the plum and cobalt together. Yes, Your porch is very welcoming. 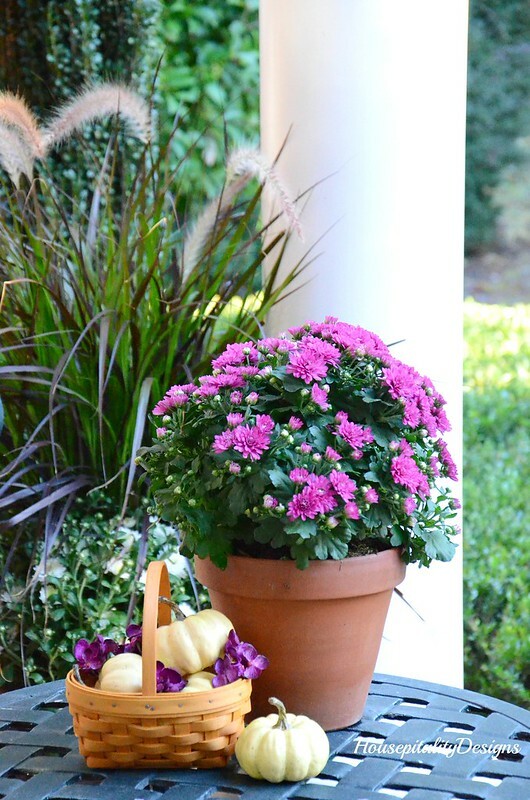 I always put mums on my porch in the fall but I should put some summer pots out. Maybe I’ll try that next year. I do have ivy in urns all year. We had some cooler weather last week but it is hot again this week. The cooler weather made it nice for porch sitting with our visiting Jacksonville cousins escaping the storm. Your porch is just stunning! 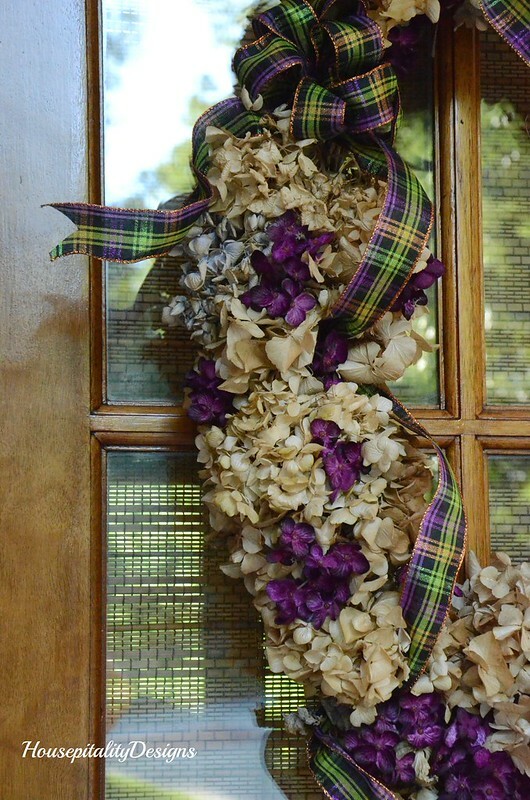 Love those plum shades and the double wreaths – Sigh! Just gorgeous! You’re just plum crazy, but in the best possible way. I loved your story about the Welcome pumpkin. I bet you were quite a sight carrying it on the plane! It definitely has become one of the things I associate with you and your porch; whenever I spot it, I know it’s your space.